Retail centres with a strong Leisure offer saw some of the highest increases in footfall over half term - especially on Valentine’s Day, when cinemas and restaurants proved to be key attractors. Significant footfall increases were seen in many city centres on February 14th, particularly those with a strong mixed leisure offer such as Nottingham and Brighton. LDC has a network of footfall sensors in each of these cities, which provides rich insight about the relative impact of key events across different zones of the centres, and the role that clusters of occupiers have during these. Nottingham saw some of the highest week-on-week increases over half-term week (Mon 13th- Sun 19th February), with data from 14 sensors across the city centre showing a 15.8% uplift compared to the previous week. This is in comparison to an 11.6% week-on-week increase at the national level. Tuesday 14th February saw the largest gains in the week, with footfall volumes over twice as high as the previous week around the cinema / bar / restaurant cluster around the Cornerhouse / Forman Street (+142%). There were also huge gains on Goose Gate (+79%). Both these locations are dominated by Leisure occupiers, with key cinema releases such as Fifty Shades Darker and major events at the nearby Ice Arena contributing to this increase. 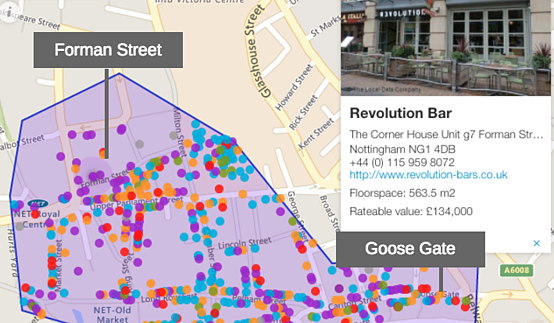 Across all devices in Nottingham, there was an extra 55% footfall between 2pm-3pm, but the largest uplift (91%) was seen during the more ‘romantic’ hours of 10pm-11pm, and this was most noticeable near the Leisure occupiers around Cornerhouse / Forman Street and Goose Gate. Brighton also saw large increases in footfall on Valentine’s Day, with the largest relative gains between 2pm-3pm (+27% on the previous Tuesday) and 8pm-11pm (+51%) – a very similar pattern to the one seen in Nottingham. Footfall volumes on West Street, Brighton (which has a cluster of Leisure occupiers and a cinema) more than doubled, and some parts of East Street saw increases close to 50% on the previous week. The increases on East Street are interesting from a retail perspective, because the 3 sensors all sit in the windows of major fashion brands. These appear to have benefited from the eclectic mix of independent restaurants and other Leisure occupiers along East Street, attracting more amorous couples than usual. Is there an opportunity for the multiples to extend their opening hours to benefit from this pattern during key events? Below is a summary of Valentine’s Day footfall, compared to the previous Tuesday, from 18 devices across Brighton. The highest increase was on West Street, near the nightclub and cinema. 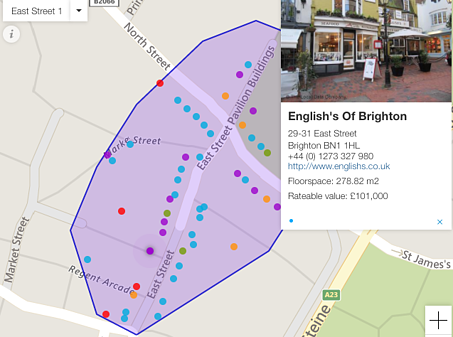 One location in Brighton actually saw a decline in footfall on Valentine’s Day. Western Road is dominated by Service occupiers – especially Estate Agents and Auctioneers, and saw a 3% week-on-week drop in footfall on February 14th. 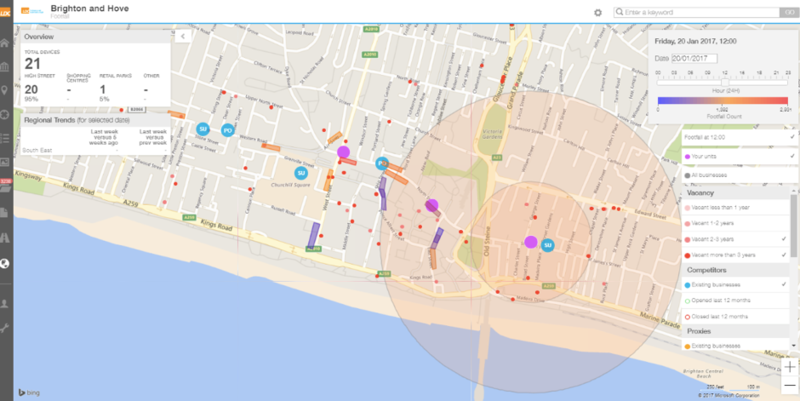 This illustrates the need to ensure all key locations are monitored in a city – not just the busiest streets, where any impacts from key events may not be representative of the city as a whole. LDC’s new mapping dashboard can be used to summarise footfall levels across the city to easily understand the local market dynamics by week, day and hour. Other indicators can be overlaid to visualise the relationship between footfall and persistent vacancy rates, clusters of businesses and recent openings and closures. The detailed insight this provides demonstrates the value of tracking footfall across the whole city centre (not just the central areas), and help understand how different zones within a city have different levels of appeal during key events. To find out more visit our Footfall page. If you have any questions, or would like to speak about measuring footfall in your location, you can email Chris at chris@localdatacompany.com.